Don't set your iOS device to Jan. 1, 1970. You won't be able to use it. Update: Apple has issued a support document about this bug. It recommends contacting Apple Support if you are having this problem. 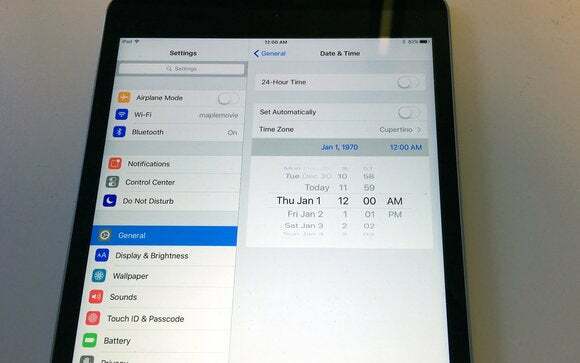 I can’t think of a practical reason for setting the date of your iPhone or iPad to January 1, 1970. But if you manage to find a reason, don’t do it. You’ll end up with an unusable device. A discussion on Reddit and an article on 9to5Mac points out that if you set your iOS device’s date to January 1, 1970 and then restart, your device won’t boot past the Apple logo startup screen. This bug occurs on iOS devices with a 64-bit processor (A7, A8, A8X, A9, and A9X) and iOS 8 or later. I was able to trigger the bug on an iPad mini 4 (64-bit A8 processor) with iOS 9.2.1. In the 3-minute video below, the first 30 seconds (after the ad) are spent setting the date and restarting the iPad mini. The rest of the video shows the device stalled on the startup screen. As I write this, it’s been about two hours since I triggered the bug. Every so often, the Apple logo disappears, as if the iPad mini will finally finish the boot process, but then the logo reappears. I’m unable to turn off the device, and when I plug it into my Mac, iTunes doesn’t recognize it except for a brief moment when the logo disappears. When the logo reappears, iTunes can’t find the device again. As for a fix, 9to5Mac says a user has been able to regain access after 5 hours while others say that the device is still unusable after longer periods of time. DFU restores don’t seem to provide a fix, either. If you need your device back right away, you probably have to visit a Genius at the Apple Store. 9to5Mac says that devices with 32-bit processors aren’t affected; the bug didn’t work when I tried it on an iPod touch with a 32-bit A5 processor and iOS 9.2.1. Why this matters: Apple does its best to provide stable software, but there will always be an odd bug or two that someone will find. Recently, there was a website that crashed Safari every time the site attempted to load. Several months ago, there was a bug that would cause Messages to crash that involved texts with a specific series of Unicode characters. Back up your data regularly and keep your OS up to date. As for the significance of January 1, 1970: It’s basically the starting point for Unix Time. Time is counted from that particular date, and setting your iOS device to this date seems to cause an overflow bug. It’s probably a relatively easy fix for Apple to implement in an iOS update.